Mornings are getting mistier, evenings are getting colder, a sign that we are slowly but surely heading towards the autumn months. 2 weeks ago though, the scenery was still very summery in the local Newlands Corner reserve, a few steps South of Guildford. 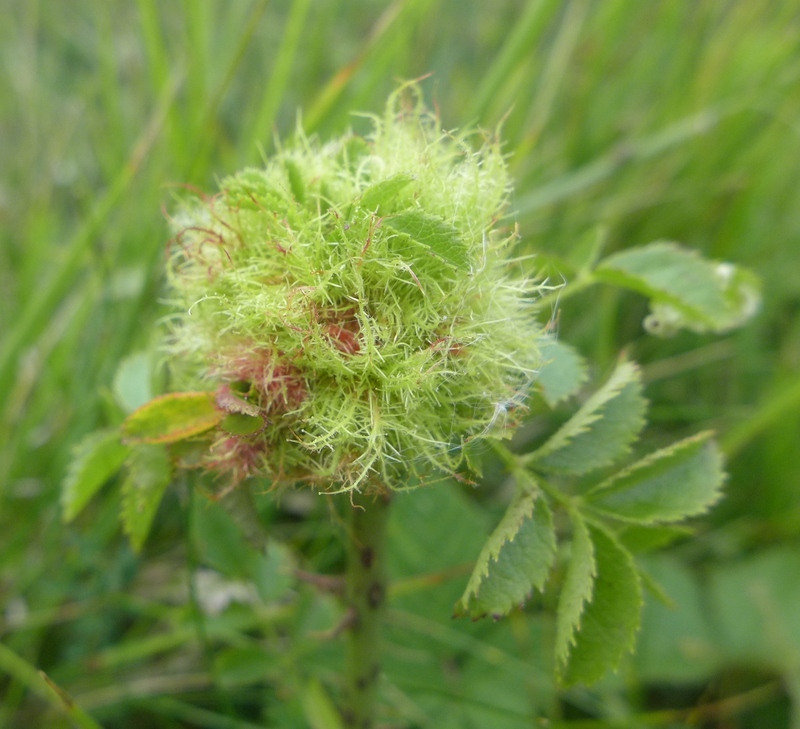 An interesting discovery, a fluffy ball of hair-like structures at the top of a Rosa stem. 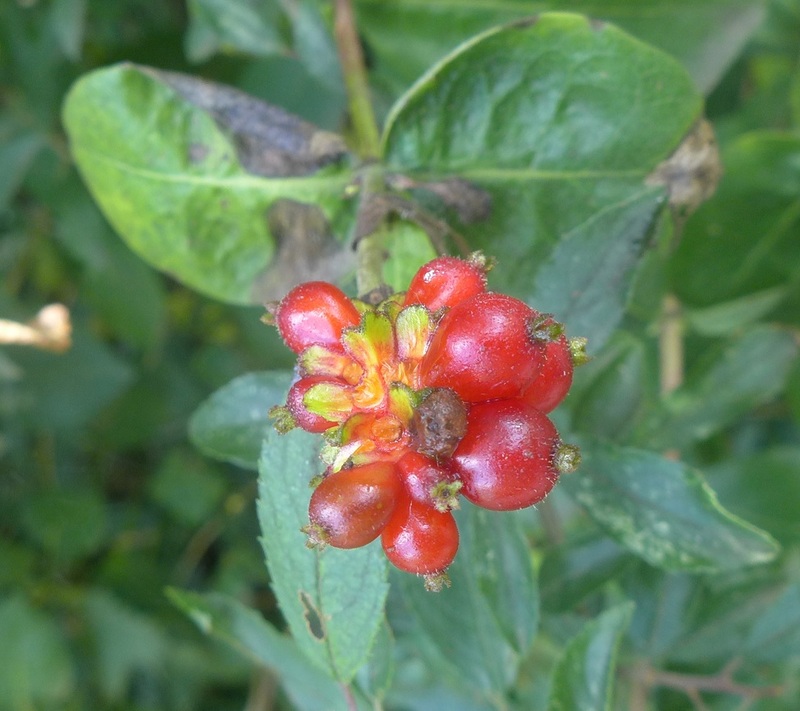 This rather showy gall, called bedeguar (or more poetically Robin’s pincushion) is caused by a small wasp (Diplolepis rosae) laying its eggs inside a leaf bud. The larva stimulates the production by the plant of protein-rich, “nutritive” cells on which it will feed. I’ve been posting pictures of all sorts of insects over the past few months, but the stars of this walk were unquestionably moths and butterflies. 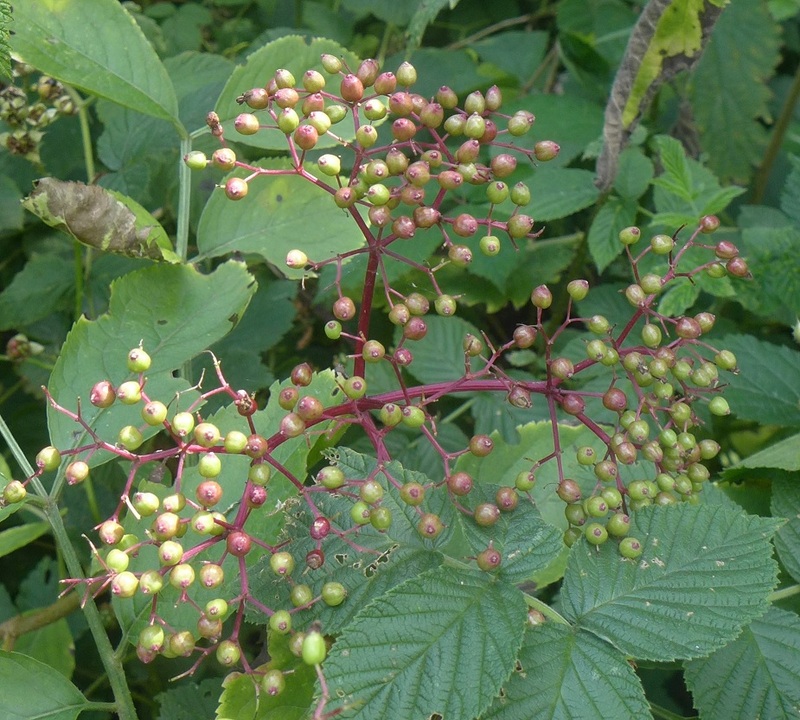 As you’ve probably noticed, they were almost absent from gardens and grasslands until mid-July (as a result of the cold spring), prompting worried communications from charities such as Butterfly Conservation (“Where are the butterflies?”, 3rd July). They have finally come out, to the pleasure of all! A common sighting of chalk grasslands are burnet moths, here three Six Spot Burnet moths (Zygaena filipendulae) feeding on Knapweed (Centaurea nigra). They are day flying moths, with a fascinating biology : burnet moths sequester compounds contained in their food plants (such as Bird’s Foot Trefoil, Lotus sp) to synthesize HCN….aka hydrogen cyanide! Cyanide is used as a defense against predators, but could also play a role in the mating process (acting as a pheromone). Another common but still lovely butterfly, the Large Skipper (Ochlodes sylvanus), seen here on one of its nectar plants, bramble (Rubus fruticosus). 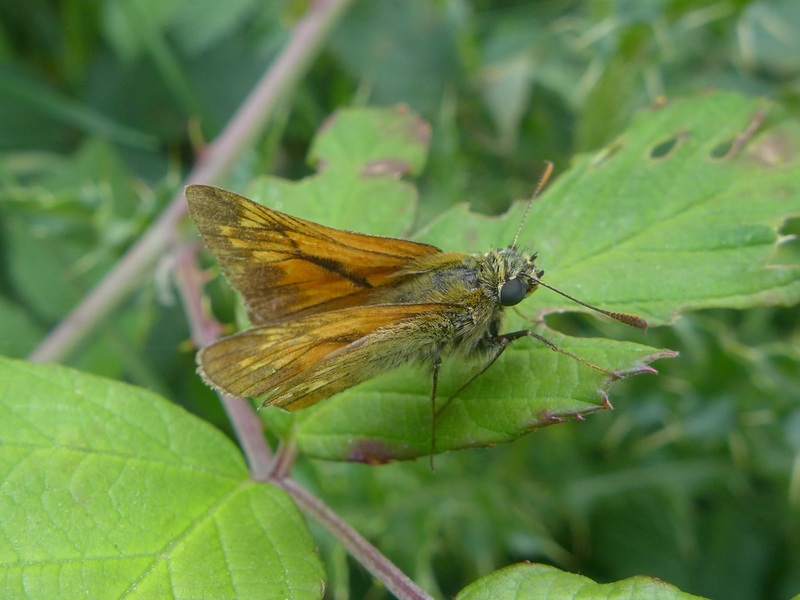 Skipper butterflies (family Hesperiidae) are a tricky group : they have stout, moth-like bodies, and clubbed antennae like butterflies (terminated by a bizarre hook), but unlike moths or butterflies, they hold their forewings at a 45° angle when resting. On Wild Marjoram (Origanum vulgare), I spotted these two Meadow Brown (Maniola jurtina) butterflies mating (does look a bit acrobatic, doesn’t it?). 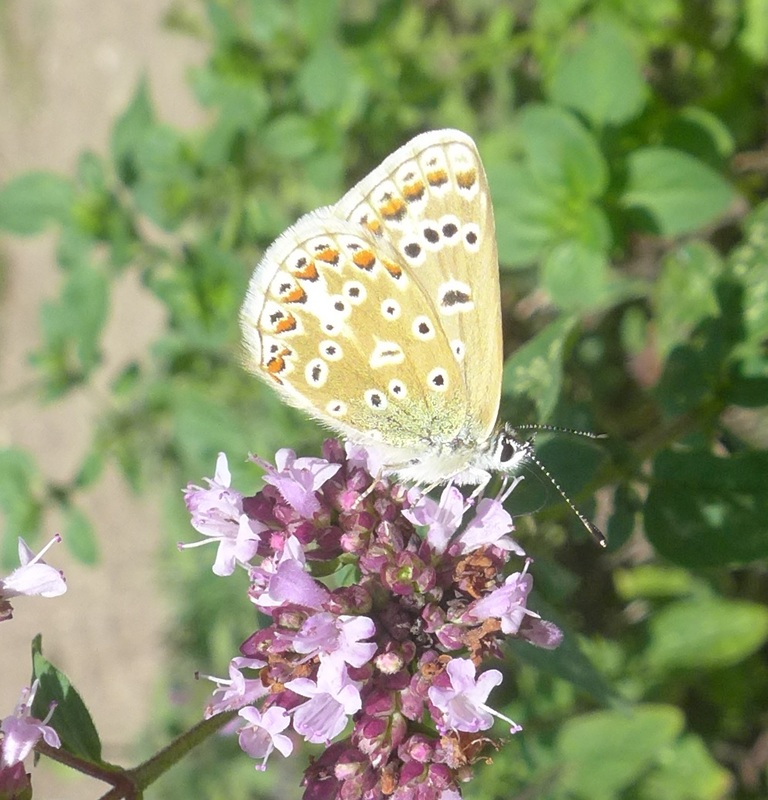 They are one of the commonest British butterflies, found in a wide range of grassy habitats. When walking in grasslands, it is easy to notice quick flying, striking, blue butterflies. There are over 10 species of so-called “blues”, so special tricks are needed to identify them correctly. I managed to see three different “blue” species in this reserve : the Adonis (Lysandra bellargus), with brilliant blue wings ; the Common Blue (Polyommatus icarus – obviously only the upper side of the wings is blue!) 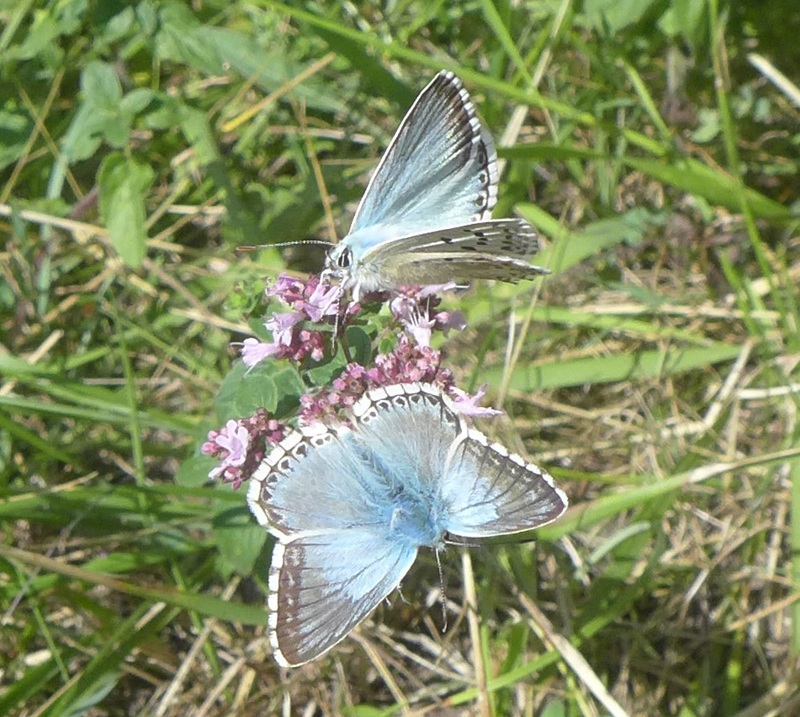 and a couple of Chalkhill Blue (Lysandra coridon, a chalkland specialist species in decline). Seeing so many moths and butterflies at once feels reassuring, especially when considering very pessimistic observations on their population numbers. According to the recently published State of Nature report, 72% of our species have declined over the last decades, and one in ten are at risk of disappearing. Habitat loss is a big concern, as with many animal and plant groups, but butterflies and moths are also particularly sensitive to changes in weather, which can crush entire populations. 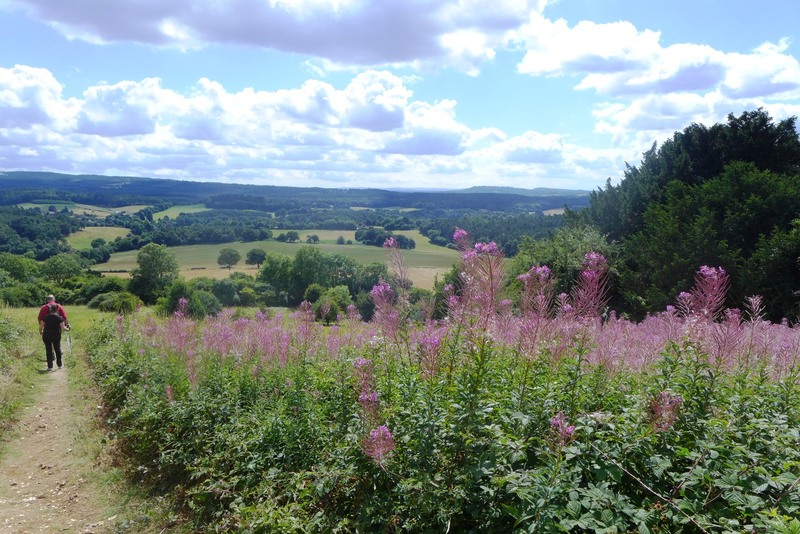 More and more initiatives are being developed to monitor butterflies and moth species, with the help of local wildlife groups, universities and councils…it might be a bit late for this year, but you can help too, by recording your sightings for the Big Butterfly Count ! Ahhhh, butterflies and moths are so beautiful! Nature is wonderful, being able to produce such vibrant colours. Hello Sophie, lovely selection of berries and butterflies. My sloe gin is maturing nicely ready for Christmas! 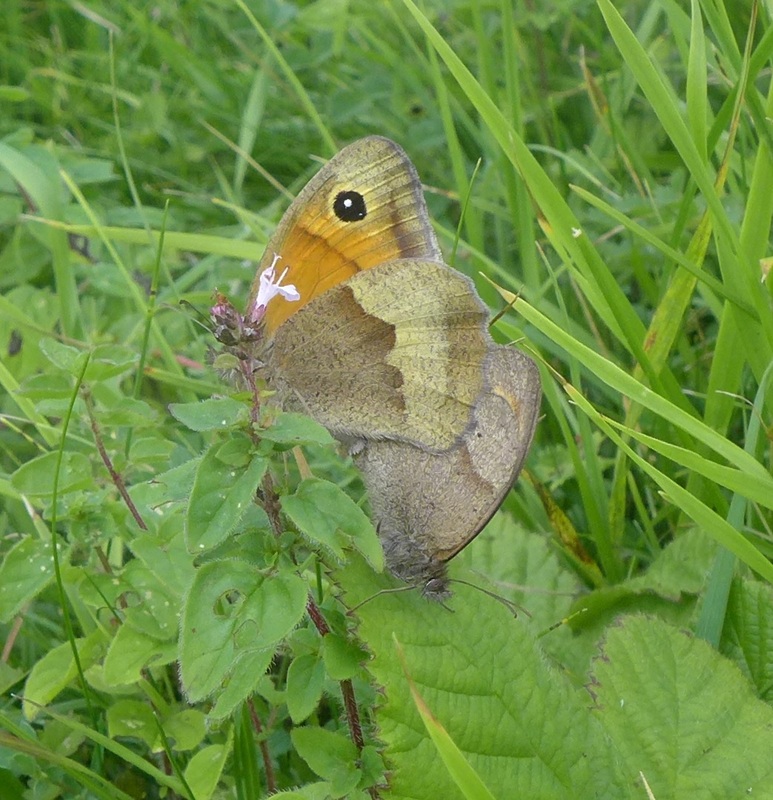 On the subject of butteflies, they were sparse in Cambridgeshire until July and August when the sun shone and numbers of many species such as the small tortoiseshell, comma, ringlet and painted lady seemed to recover. Others such as the common blue and the skippers were reduced for the whole year. 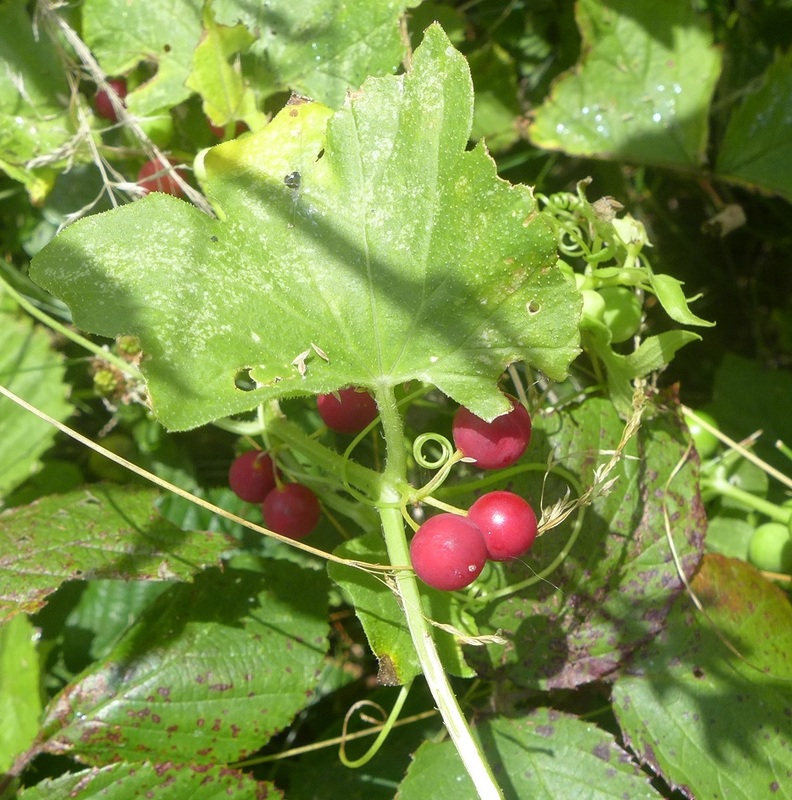 I hope we get a mild winter and a favourable year in 2014 so more species can recover.